One night in Canberra for work, means I need a cheap hotel, with a good desk, and a good bar to have a working meeting with a colleague. With the change of seasons upon us, you don’t want to be caught in early morning fog on a flight into Canberra, and miss the start of your work day, so wisely, I catch a flight down the previous day. The project doesn’t really cover a nights accommodation, so it has to be cheap, but good enough to enjoy, have a good working desk, so I can do some late work, and a bar or restaurant space where I can meet and successfully complete some work with a colleague. That means space enough for a computer, quiet enough to hear a conversation, and with an alcoholic beverage or two on tap. The QT in Canberra meets that brief. While booking my flight on Qantas – I take up the accommodation option, getting $30 off a room at the hotel, taking the price down from a very reasonable AU$152, to a cheap AU$122. I know I’m going to get a basic entry room (QT Standard, queen bed, shower), but it’s only one night. 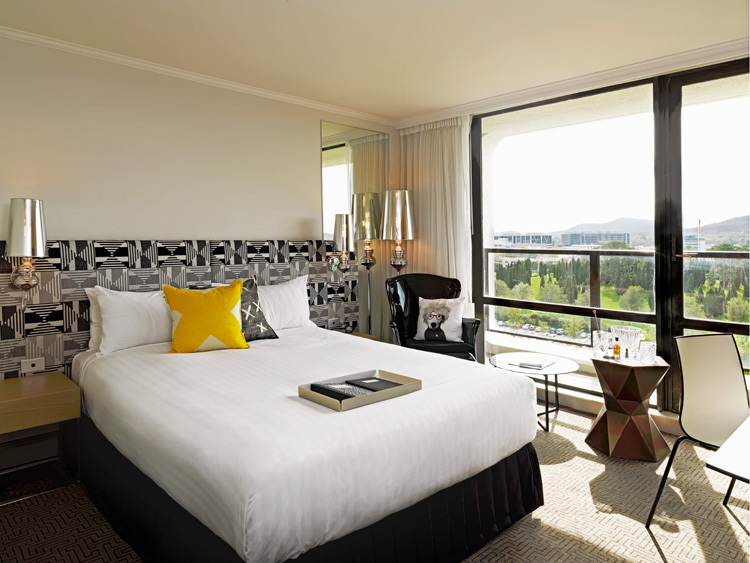 The QT is a great business hotel, and an alternative to some of the more expensive options in Canberra. The room I had was snug, but more than adequate for one person. Bathroom is snug, but serviceable. The quirky decor is fun, but the ‘Shop-in-your-room’ is annoying. Great bar to meet and work in; well designed rooms with all you need to wash, sleep and work; nespresso machine in room. No table service in the bar, and remove the ‘Shop-in-your-room’ experience. Does anybody really use that set up to make a Negroni? Summary Good business hotel, but the quirks are oversold. Great bar to work in, but no table service. NextSydney Airport buys Terminal 3 from itself?